The Super Six World Boxing Classic is finally coming to an end, taking much longer than planned, having too many problems along the way. Andre Ward, as expected, made the final, not exciting anyone, but easily (pretty much) going through opponents. Carl Froch had a rougher, but funner to watch, road to this fight. More than just a unification of Super Middleweight belts is on the line. For Showtime, always struggling to prove they can get big fights their way facing the HBO giant, this needs to be a big fight. The Super Six tournament is a great idea, but the way it dragged out with fighters withdrawing and entering seemed to bleed away the importance of the event. For Carl Froch, it’s about his reputation, legacy, and fighting the home advantage. Unlike Ward, Carl Froch, 34, the WBC champion with a 28-1 record with 20 KO’s, loves to talk. Loves to hit big, take risks, and talk. It’s always a concern, I’m fighting an American on American soil. He’s an Olympic gold medallist, he’s the golden boy, he’s undefeated, he’s a great talent, he’s young, good-looking, he speaks well, he’s got all the marketable things that a broadcaster like Showtime wants. Amir Khan’s defeat against Lamont Peterson last week in Washington didn’t come without its share of controversies – the deductions for pushes, the scorecard incident. All about home advantage, which turns out to be too much of a factor every time. Froch needs to really impress, meaning dominate Ward all night long if he doesn’t score a knockout. Problems is, it’s highly unlikely that Froch will be able to outscore Ward. If Carl Froch doesn’t get an early advantage, meaning constant pressure from the first bell on the American, this will be Ward’s fight. Ward is a fantastic defender with excellent technique and simply has no weakness in his game. He got it all, except for the big punches, the power. He is a great fighter. He is an Olympic gold medallist and unbeaten as a professional. He is a world champion and he has a win over Mikkel Kessler. You have to take him very seriously. The one thing he has going against him is he is not a big puncher – he does not stop many of his opponents. I punch very hard and I will be putting it on him from round one. I can’t be starting slow, I need to come out of the blocks early – especially if his cut opens and it has to go to the scorecards after four rounds. I have to make sure I get a good start and win the early rounds. At 34, Froch won’t have chances like this one to cement his name in the history of the division and the sport if he loses. For Andre Ward, who hasn’t lost a fight since the 1990’s, back in his early amateurish days, a loss doesn’t even seem like a possibility. He isn’t talking much, but his record, 24-0 after winning the Olympic Gold Medal in Athens, speaks for itself. The problem with Ward is his style. He could be a pound-4-pound king, a media darling. He has the smile, and he can turn on the charm from time to time. But his style, and low knockout rate, prevent him from reaching higher popularity numbers. It’s his style, his defensive style, that keeps him winning with hardly getting scratched in all of his fights so far. He did beat Mikkel Kessler to win his WBA belt. Kessler is the only fighter to ever beat Carl Froch. That fight was in Denmark when Froch faced the Dane. Home advantage had something to do with decision? Froch certainly thinks so. Ward, who usually fights in California (born in San Francisco), handled Kessler rather well. Both Froch and Ward fought Arthur Abraham. 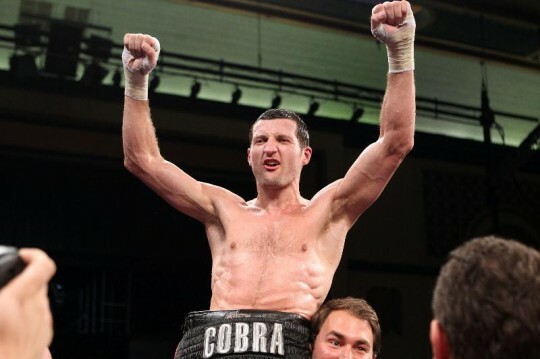 Froch thought his win over Abraham was the more impressive of the two. It doesn’t really matter. Froch will be looking to KO Andre Ward, and although the fight will be in Atlantic City, Jersey, home advantage will mean plenty. Boxing shouldn’t be a popularity contest, but it is. Andre Ward just needs to keep tight, stop this fight from turning into a brawl and a mess like Froch would love it to, and the win is his. You gotta love Froch for what he’s done these past few years. Taking on every possible big name in the division, winning all those fights but one. His most recent win, a majority decision over Glen Johnson, might tell us that Froch, with all the wear and tear on his body, is a much more up and down fighter than Ward. Froch needs a lot of things to go his way on Saturday night. 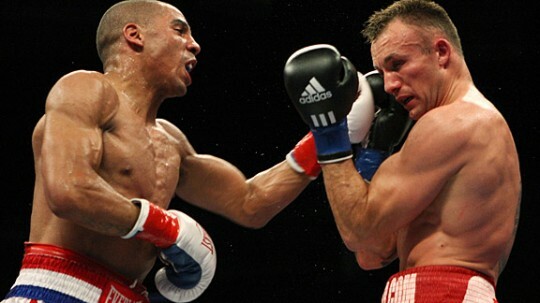 It’s a much more simpler task for Andre Ward to simply stay the course.